Nourish yourself with the best of the winter produce in a fraction of the time with your Instant Pot! Last year when I started playing around with my Instant Pot a bit more, I fell in love with making some of my staple soup recipes in much quicker time. 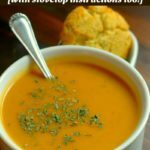 It meant that I could have veggie soups on the table most days of the week – and for this busy work at home mom with 3 kids under 7 years old, that meant…a lot! I had gotten into the habit of just tossing everything in and hitting go, foregoing that precious little “Saute” button that our Instant Pots come with. 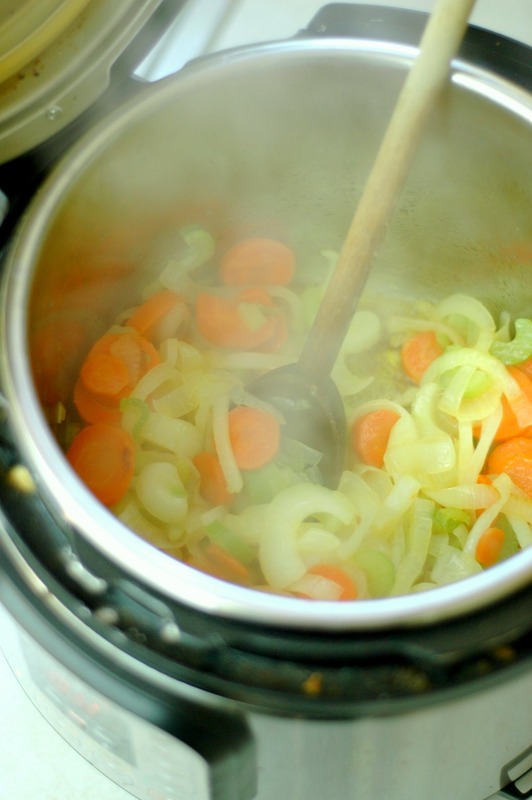 A 5-10 minute butter sauté with some key veggies (namely the aromatics like onion, carrots, celery, etc), takes a pot of soup from good to amazing. As those aromatics cook with a little butter and sea salt their flavor changes and brings a sweetness and depth of flavor to the soup that will hook in just about any hesitant soup eater. Back to the basics…with a little modern convenience thrown in! So when it comes to my Instant Pot I’ve gone back to my traditional cooking roots to get that flavor, and am still enjoying the convenience of a quicker cook time than the stovetop would yield. Whether you are a novice cook, or a seasoned foodie I think we would all agree that an extra 5 or 10 minutes to get amazing flavor is worth it – especially when it will be devoured as quickly as this pot of soup did! So some of us don’t think of very many veggies being in season in the winter (at least those of us with snow piled knee high!). While there certainly isn’t the abundance that late August brings, you really can find some great seasonal vegetables to use. Sometimes our grocer is hit or miss on a few of these items, but I would say that the vast majority of us have access to most of this list to at least pair a couple items together with staple onion, carrot, celery aromatics and make a really great soup! 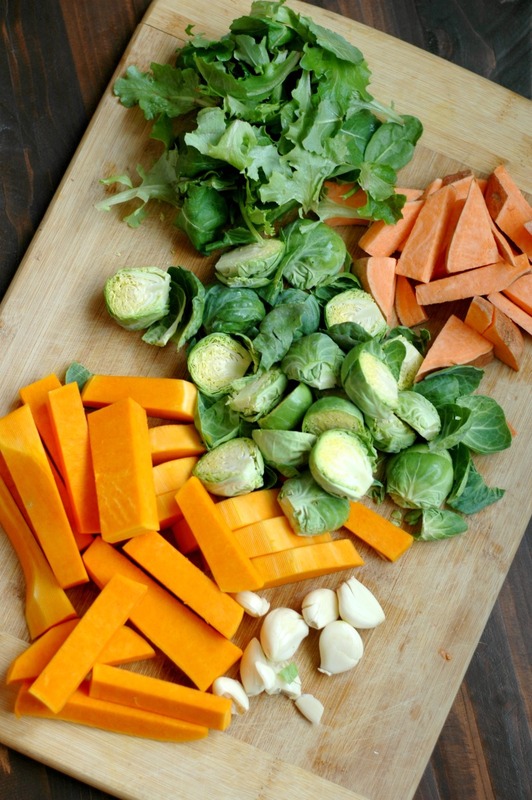 Just be sure you include at least one “sweet/creamy” starchy veg such as one of the squashes, sweet potatoes, or potatoes to balance out the sometimes bitterness that dark winter greens can have. At home comfort in a pack-able meal! This entire pot of soup didn’t even last a week in my house! Between lunch that day, packing some up for my husband’s Travel Crockpot for work lunch, my breakfasts, school lunch thermoses, and my toddler’s tea cups, it was G.O.N.E.! If you have never used a Travel Crockpot before, and you work away from home, boy are you about to be mind blown! We actually have 2 of these so that my husband can bring multiple meals to work. He keeps a warming base at work and we have 2 of the liners that he brings home to wash and re-fill. Oftentimes he likes to bring soaked oatmeal for breakfast in one liner, and soup/dinner leftovers in the other. It is really great for those who are gone from home most of the day. If you want to read more about how to “temper” a school lunch thermos for the kids so their soup is nice and warm at lunch, this article explains that better! 1/4-1/2 tsp chipotle pepper or cayenne optional if you don't like the heat - we love it and it really brings it to another flavor level! Not to mention the warming heat is great in the cold winter here! Set the Instant Pot to "Saute," melt the butter in the bottom of the pot, and then add in the onion, carrot, and celeriac with a big pinch of sea salt. Saute the veggies for about 10 minutes stirring occasionally while you chop up the rest of the veggies. Turn off the Saute feature and toss in the rest of the veggies and the bone broth. Put the lid on, close the valve, and press "Soup". Bring the time down to 20 minutes, and it will turn on automatically. Once the pot comes to pressure, the 20 minutes will count down. After the 20 minutes of pressure cooking is done, turn the pot off, and open the valve to let the pressure out. Puree the soup with a handheld blender or in batches in a regular blender. After the soup is pureed you can sea salt and pepper to your taste. Garnish each bowl with parsley if you wish. The best part about this section is that it really isn’t much different than using the Instant Pot! 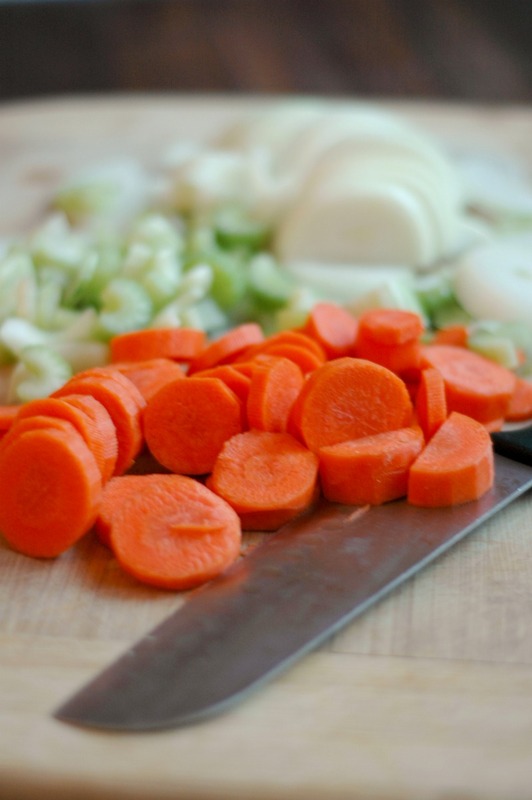 You can still save a bunch of time by just coarsely chopping your veggies – no need to be a perfect dice when it is all going to get pureed anyway! Simply saute the aromatics in butter like the first step. Then add in everything else, bring the whole pot to a simmer, cooking until the veggies are tender. Simmer it at the back of your stovetop so that you can tend to babies, clean up the kitchen, or fold laundry while it simmers away. I did this for literally years dear mommas…I have only had an Instant Pot for a year and a half! Fancy tools are so great, but you really only need a good soup pot if we are being honest! 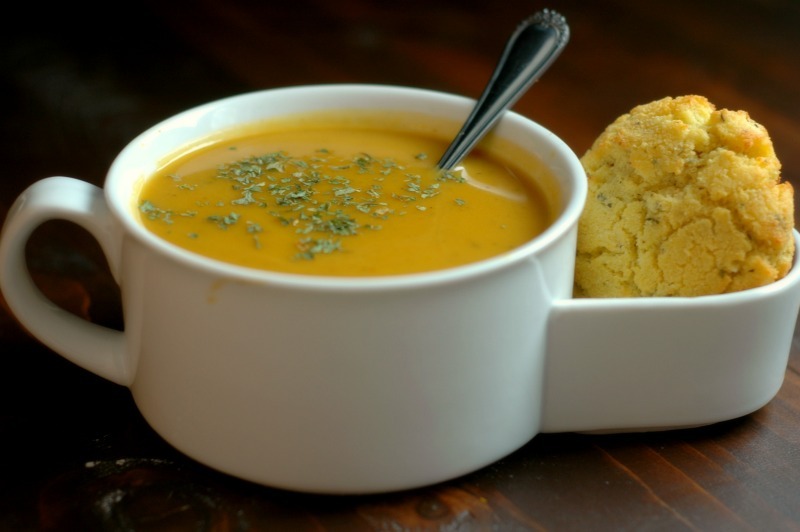 Biscuit and cracker ideas to go with your soup! 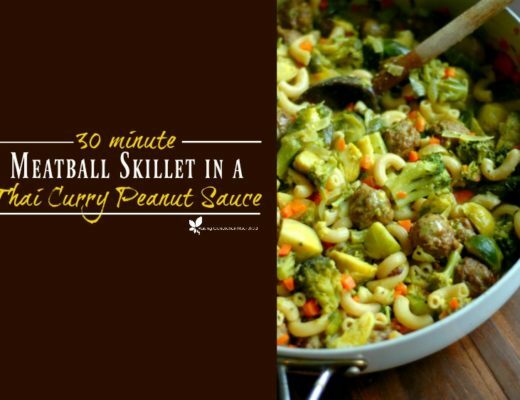 30 Minute Gluten Free Meatball Skillet in a Curry Peanut Sauce :: Nut Free Options Included! I love what you said about having staple soups on the table most days. I feel best, too, when this happens; and like you said, the IP REALLY helps make that happen without stress in so much less time. 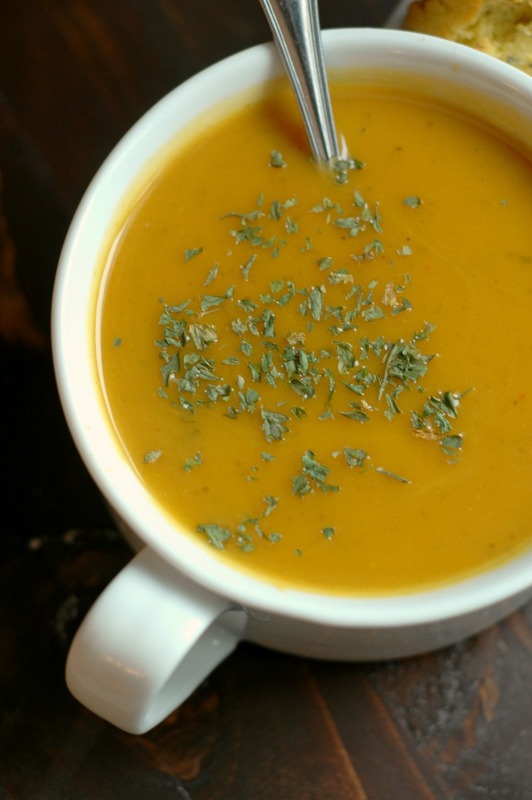 Thanks for sharing another beautiful soup with bone broth! Yes Megan! And you are welcome! I would never have guessed those Brussels sprouts were in there! What a brilliant idea! This sounds AMAZING and I love how quick it comes together. Yum! Makes me want an instant pot! 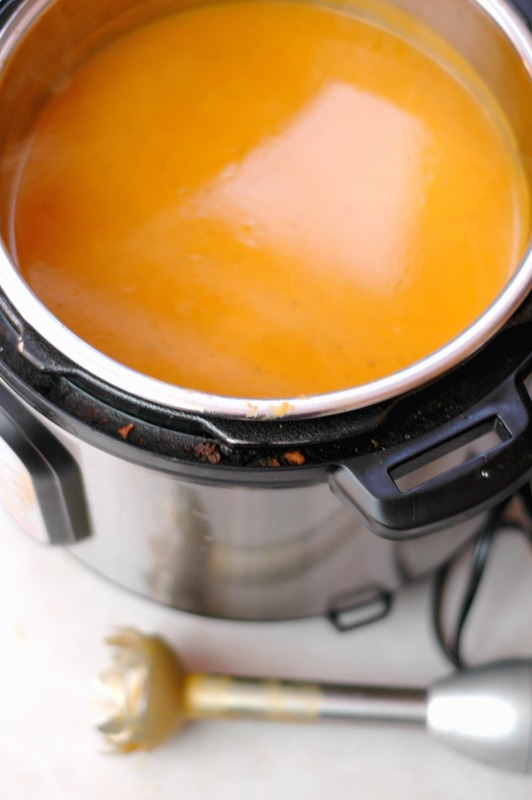 Soups in the pressure cooker are my jam! This one looks divine, and that little bowl with the attached bread dish is to die for! I’m a soup girl and this soup just makes me want to make another huge pot this coming weekend. 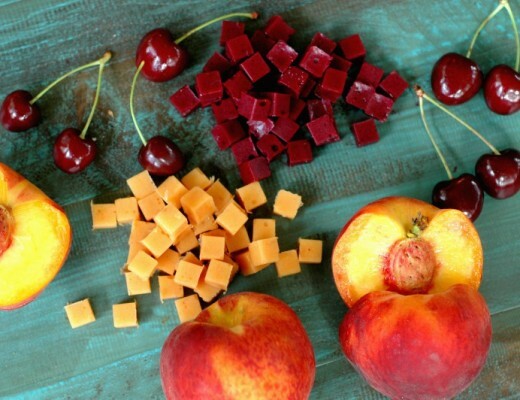 Thanks for sharing another one of your fabulous and nutritious recipes ! YUM !! Wow, it makes that much of a difference to not saute the veggies, eh? I never would have guessed. Good tip though. 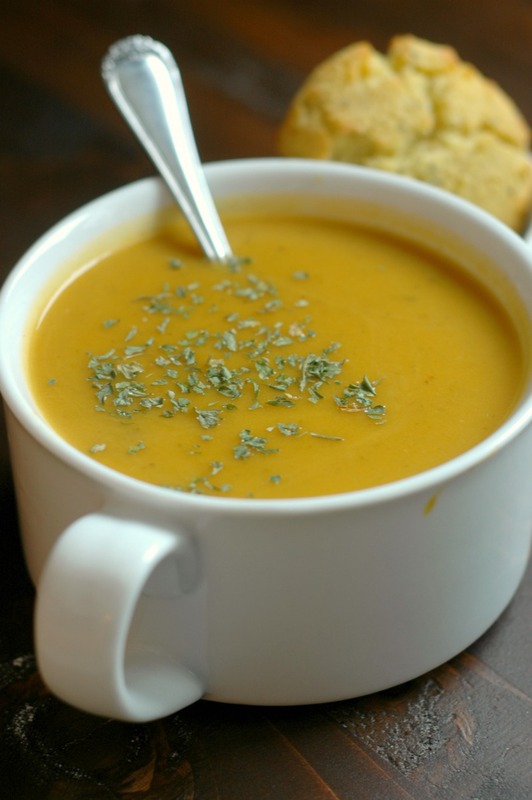 And this soup looks delicious – will definitely have to try it! What a great tip that I seem to always forget- sauté! I use that button after cooking to reduce liquid, but skip it at the beginning. I’ll remember that next time to help develop the flavors 🙂 This soup looks so delicious and creamy! I’m loving all those veggies in it! I love that you can saute in the Instant Pot before you cook. This looks so good! Can’t wait to try it! I’m totally looking into that travel crockpot, I think my husband is going to love it! I’m always looking for more IP recipes! Love all the veggie goodness packed into this one. Can’t wait to try it! It’s so cold here this would go down an absolute treat! Looks so delicious! I firmly believe that a lot of salt, and a lot of butter (and some good stock doesn’t hurt) are the keys to a good soup. This looks like to be the perfect wintertime soup. Now this is exactly what my soul needs. 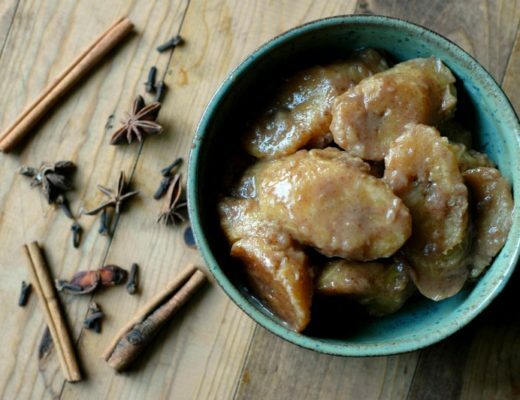 This is my kind of winter comfort food, so yummy! This soup looks so warm and wonderful! My kind of food 😃 I love that bowl with the side dish for the rolls! What a find! Oh there are so many of my favourite veggies in this soup! Looks like cozy perfection. And the color is so rich and lovely! Hi Renee! Can you tell me how many servings this makes? There are only two of us so i’m wondering about scaling or maybe just freezing extras. Thanks! Hi Sue! It fills up about the whole Instant Pot! I usually serve it to my family of 5 and then have a quart or 2 leftover for the freezer – so I would say a good 3-4 quarts it makes. It freezes well, though you can certainly halve the recipe too. So beautiful and I guess delicious. 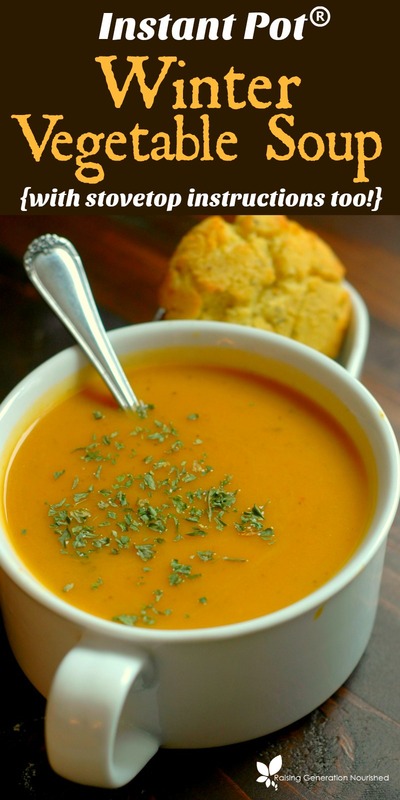 Even though I am not a big fan of soups, this one is I definetely will try! Thanks for the recipe Renee. I modified it a bit because, well that’s what cooking is all about. I’m just getting started with my Instant Pot and get fired up every time I set up a new adventure with it. I used coconut oil as my sauté used dried herbs up front then fresh at the back end, added cauliflower, and used both leek and sweet onion. Very tasty and easy to prepare. Great Gordon! Glad you enjoyed it! Oh yum, this sounds so creamy and delicious! And I love all the veggies in you included in it. Healthy and comforting!